Service Dogs: HowCan I Get My Dog Certified? Service Dog. Therapy Dog. What's the Difference? 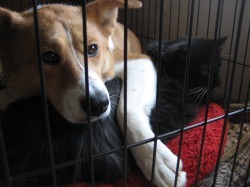 Pictured at the left is my dog, Ginger, a 2-year old Collie mix I adopted from the Dubuque Regional Humane Society at the age of approximately 3 months. 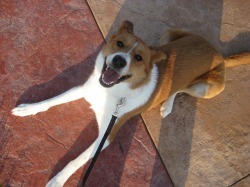 This photo was taken last fall when Ginger was approximately 1 year old. 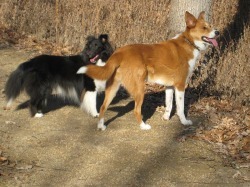 Ginger and her dogpal, Nuschka, a 3-legged Shetland Sheepdog (Sheltie) enjoying an outing on a local trail - Ginger helped Nuschka overcome her fear of water! My cat, Max likes to go into Ginger's crate and sleep on her red heart pillow. Ginger goes in behind him and lies down next to him, sometimes putting her front leg and, in this case her chin on his back. Ginger has helped me raise 3 litters of foster kittens for local humane societies. 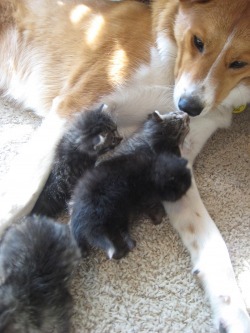 She's very gentle with the little ones and seems to enjoy watching over them.